From the above receiver structures, we saw that MMSE equalisation with optimally ordered Successive Interference Cancellation gave the best performance. In this post, we will discuss another receiver structure called Maximum Likelihood (ML) decoding which gives us an even better performance. We will assume that the channel is a flat fading Rayleigh multipath channel and the modulation is BPSK. 2. In normal transmission, we will be sending in the first time slot, in the second time slot, and so on. 3. However, as we now have 2 transmit antennas, we may group the symbols into groups of two. In the first time slot, send and from the first and second antenna. In second time slot, send and from the first and second antenna, send and in the third time slot and so on. 4. Notice that as we are grouping two symbols and sending them in one time slot, we need only time slots to complete the transmission – data rate is doubled ! 5. 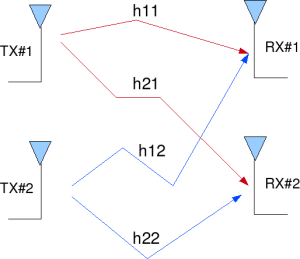 This forms the simple explanation of a probable MIMO transmission scheme with 2 transmit antennas and 2 receive antennas. is the noise on receive antennas. We assume that the receiver knows , , and . The receiver also knows and . The unknown s are and . 2. The channel experience by each transmit antenna is independent from the channel experienced by other transmit antennas. 3. For the transmit antenna to receive antenna, each transmitted symbol gets multiplied by a randomly varying complex number . As the channel under consideration is a Rayleigh channel, the real and imaginary parts of are Gaussian distributed having mean and variance . 4. The channel experienced between each transmit to the receive antenna is independent and randomly varying in time. 7. The channel is known at the receiver. 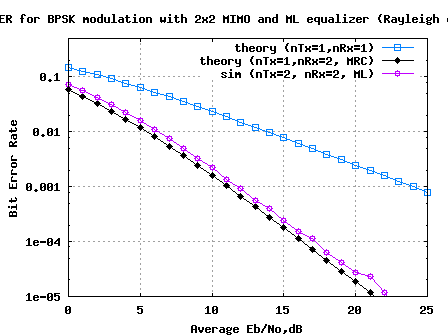 Since the modulation is BPSK, the possible values of is +1 or -1 Similarly also take values +1 or -1. So, to find the Maximum Likelihood solution, we need to find the minimum from the all four combinations of and . if the minimum is . (a) Generate random binary sequence of +1′s and -1′s. (c) Multiply the symbols with the channel and then add white Gaussian noise. (h) Repeat for multiple values of and plot the simulation and theoretical results. 1. 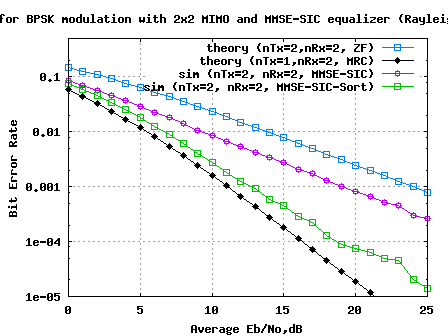 The results for 2×2 MIMO with Maximum Likelihood (ML) equalization helped us to achieve a performance closely matching the 1 transmit 2 receive antenna Maximal Ratio Combining (MRC) case. 2. If we use a higher order constellation like 64QAM, then computing Maximum Likelihood equalization might become prohibitively complex. With 64QAM and 2 spatial stream we need to find the minimum from combinations ! In such scenarios we might need to employ schemes like sphere decoding which helps to reduce the complexity. @Vaibhav: Are you getting zero BER for no-noise case? One can use that for debugging the code. Then as you said, one need to find the cost function Jxxx for all the 2^3=8 combinations and then try to find the minima among them. sir you told that For the 2×1 STBC system, the zero forcing equalizer should have given the same performance as ML equalizer, but zero forcing have some disadvantage .so can you provide me a refr. for coding in which ML is use for 2×1 STBC system. @raj: For 2×1 STBC, the zero forcing equalizer is optimum as there is no interfering term. why we should change 0 into -1? is there any reason? Do you know any equalizer which doesn´t need to know the channel? @Gidy Florez: Well, am guessing that you are referring to equalizer estimation algorithms. 1. which type combiner use? How can we make sur that this results is correct. Is there any theoretical analysis for ML, that we can plot and compare with the simulation?? @Raj: I recall referring to the curve in Digital Communication: Third Edition, by John R. Barry, Edward A. Lee, David G. Messerschmitt. man i am such a big fan of yourz… your make the incomprehensible seem topics quite easy and understandable. I am working on blind channel equalization (i am trying to simulate CMA and RCA in MATLAB for time varying, multipath rayleigh channel). just wanted to ask have you tried this domain? can you provide me some guidance in this area? any idea about some good website which may help me in my Matlab simulation of said algos. Its urgent coz I am stuck at some point and couldnt find any way out. @sara: Thanks. Have not looked into the blind equalization topic, sorry. I was sent an message to your email. I need your help about this post but use QPSK modulation. Hope you can read my message. i want to ask some question about this project. 1. what does “2*ip-1;” means? whether 2 represent number of bpsk constellation? 2. i have tried this program with 3×3 and 4×4 Rx/Tx combination, it’s the result : http://cdn-u.kaskus.us/71/joci0gkv.jpg . is it true? 3. can this program use for qpsk, 16qam, and 64qam constellation? - I have tried for use combination of 1×1 Tx-Rx in this project, but I must get an error in “Channel and noise addition” part. Why? - Which part should be change for use QPSK modulation beside changing the combination of sHat? hi Krishna,do you have any code for MIMO OFDM using Sphere Detection? can you spare me some clue to solve this method? Hi Krishna, Do have any information and matlab code for Semidefinite program (SDP) relaxation detector (optimization problem). Please can u give 16QAM code instead of BPSK using ML ? Why is my comment deleted ?? I have already read your articles about the ZF, MMSE and ML detection methods in MIMO. I wish to know whether the ML solution for Y = HX+Z (either X or H to be unknown) has a closed form expression or not. Although I know it does not, but of my surprise is that I have come across some papers indicating that the ML solution for the above equation has a closed form similar to what you have mentioned in ZF equalization. Is ZF method equivalent to ML? @Vahid: I believe the ZF solution is equivalent to ML only if the channel is orthognonal. In other cases, ML is able to combat the interference terms, whereas ZF does not do a good job at that. can u just tell me that whether ur matlab code for ml equalisation utilises viterbi algorithm aur something else?? please reply it is really very important. Idon’t try to simulte cfo for mimo system only but for mimo ofdm I propose a new scheme that targets MMIO OFDM systems which have unsynchronized oscillators such that CFO of individual paths have to be estimated separately. This scheme may also apply to OFDM systems with multi-user access. The new method, which is similar to Moose’s method, estimates the CFO by measuring the carrier phase difference between 2 identical successive training sequences embedded in the preambles. In order to make CFO estimates be more time efficient,I allow 2 transmitter antennas transmit their training sequence concurrently in every time period, except the first and the last period. I use Frank-Zadoff code with different phase shifts in the training sequences in different antennas. Due to the good correlation property of Frank-Zadoff code, it helps reduce the interference caused by the concurrent transmissions from other antennas. Idon’t try to simulte cfo for mimo only but for mimo ofdm system After examining some synchronization I propose a new scheme that targets MMIO OFDM systems which have unsynchronized oscillators such that CFO of individual paths have to be estimated separately. This scheme may also apply to OFDM systems with multi-user access. The new method, which is similar to Moose’s method, estimates the CFO by measuring the carrier phase difference between 2 identical successive training sequences embedded in the preambles. In order to make CFO estimates be more time efficient,I allow 2 transmitter antennas transmit their training sequence concurrently in every time period, except the first and the last period. I use Frank-Zadoff code with different phase shifts in the training sequences in different antennas. Due to the good correlation property of Frank-Zadoff code, it helps reduce the interference caused by the concurrent transmissions from other antennas. Idon’t try to simulte After examining some synchronization I propose a new scheme that targets MMIO OFDM systems which have unsynchronized oscillators such that CFO of individual paths have to be estimated separately. This scheme may also apply to OFDM systems with multi-user access. The new method, which is similar to Moose’s method, estimates the CFO by measuring the carrier phase difference between 2 identical successive training sequences embedded in the preambles. In order to make CFO estimates be more time efficient,I allow 2 transmitter antennas transmit their training sequence concurrently in every time period, except the first and the last period. I use Frank-Zadoff code with different phase shifts in the training sequences in different antennas. Due to the good correlation property of Frank-Zadoff code, it helps reduce the interference caused by the concurrent transmissions from other antennas. i am new to simulation. i want to simulate uplink multiuser MIMO-OFDM detection. i have to do this for LS, MMSE, SIC, V-BLAST and ML. BER comparision and complexity comparision has to be done. Users have only single antenna and BS has multiple antenna. my system model is as follows- first generate data then mapping (i m using BPSK ) then serial to parallel converter then ifft (i m taking size-128) then cp (i m taking 10% of ifft size) then parallel to serial then transmit it. i have doubt in all the bracket values why and what value should we choose? I have to transmit this multiple user data through Rayleigh frequency selective fading channel. how to generate this channel? and at the BS should we use OFDM demodulation just before MUD block at each receive antenna? Sir please help me?and Kindly give me steps and approach for simulation? your site has been very useful to me. thank u so much. but i have a question abt the MIMO ML Equalizer matlab code. what does ipHat(1:2:end) = ref(dd,1) do/mean? i am new with matlab. @doris: Based on which variable minimized the error, am picking the data bits accordingly. Is there any formula or program to count number of multipliers and division to form an estimate of complexity? how can we measure the diversity orders of all these detectors? Should i get program or formula for maximum likelihood (ML) with sphere decoder(SD)? 3/ I have not yet discussed sphere decoding. but should i have to calculate operations based on mathematics? and suppose if i am sending 1000000 sybols, than operations have to multiply with 1000000 or not? i have read somewhere that the slope of BER vs SNR gives diversity order, is it true? and which book give the detail regarding to diversity order? 1. How can i measure the complexity? 2. Which operations have to considering during complexity calculation? once again greate thx for helping me. i am doing project on mimo so please if possible provide me a ml detect code . @park: Using this ML code as a reference, you might be able to overlay an OFDM tx-rx on top of this. Good luck. Could you help me how I can can derive the BER of SC-FDMA system? @Faisal: The SC-FDMA is close to OFDM, no? So, wont the BER of underlying modulation scheme hold good? I am search lot but i am not getting the inverse of 4*4 matrix, so please can you tell me what is inverse of 4*4 matrix and whts the procedure to obtain it? Thanks for your sharing..It’s really useful for understanding ML decoder in order to decode for MIMO cases. If possible, can you show us how a linear orthogonal decoder works? @Coldfish: Can you plz give me an example of linear orthogonal decoder. As far as I know, orthogonal space-time codes can be decoded with a linear orthogonal decoder. I am not %100 percent sure but in spite of using ML decoder at the receiver, we can use the equivalent H channel matrix to decode the symbols. If the code matrix is an orthogonal design, without using all combinations of matrix (ML decoder), we can decode as well with equivalent H matrix easily. Specifically, I stated that how we can decode OSTBC and QOSTBC designs? Is it possible to give some examples about that? I think QOSTBC are decodable with Pairwise ML decoder. @Coldfish: Yes, if the code is orthogonal we can do with linear equalizer (as we discussed in STBC case, http://www.dsplog.com/tag/stbc). I have discussed only a simple Alamouti case, which is an orthogonal code. I need to read up more on non-orthogonal STBC cases and QOSTBC (Q for Quasi?). Its me again! Thanks for all your wonderful help!! Based on your MIMO 2×2 codes, apparently it cannot work if i just change the nTX & nRX if say i want to do for 4×4 scenario. Is it possible to modify your codes to fit 4×4 or will it be extremely tough? Pls advise! !Thank u!! 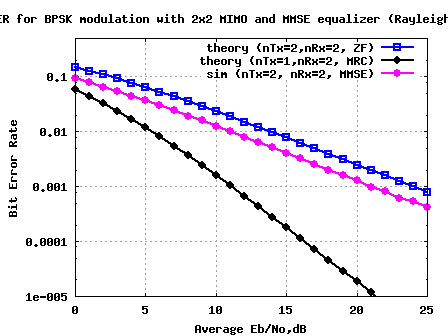 @Sivam: By simply changing nTx, nRx to 4 wont enable a 4×4 MIMO scenario. Reason being, the equalizer which is currently an inversion of a 2×2 channel does not scale up gracefully. When changing to a 4×4 MIMO link, pay close attention to the equalizer part. Good luck. Can you describe the sphere decoding algorithm in detail? hi, have you thought about if the modulation scheme of one of the transmiter is unknown, how can I calculate the BER? Here is something with modulation classification. @Bob: Well, if we do not know the type of modulation, it might be a bit too difficult, no? In general, we know the modulation type ie. BPSK/QPSK/QAM etc and based on that information, we define the demodulation structure. Btw, am curious: can you plz specify some more details about the scenario in which were the modulation scheme of the transmitter is unknown at the receiver. Thanks. Thanks a lot for your sequence of knowledge about MIMO receivers. 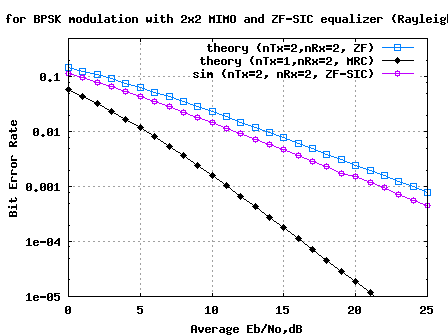 As your results about different methods, it can be seen that receive diversity with MRC gives better performance than any kinds of MIMO receiver (ZF, ZF SIC, MMSE, MMSE SIC, ML), is it right? Pls explain me about this. @Chi Pham: Well, I do not think that the statement “it can be seen that receive diversity with MRC gives better performance than any kinds of MIMO receiver” – is correct. Receive diversity with MRC is applicable even in non-MIMO cases also, for eg, 1 transmit 2 receive MRC case. Hey sir,u have sed dat for mimo 1 has to pair up data n den transmit it,cant we send a copy of data at both transmitters and den at da detectr side select the bit with more power u can say,is it da right approach or not?? @maya: Typically, sending the same information from two transmit antennas at the same time does not provide benefits. The approach which you said can be done at the receiver, if we have more than one receive antenna. The post on selection diversity briefly touches on this aspect. with regard to 2×2 MIMO with ML eqaulization what the changs in the simulation code if there are 8 transmit antenna instead of 2. @yaxeed: Did you mean, you would want to find out the result, if we use QPSK instead of BPSK. Good luck in your algorithm explorations. @ramu: sMod is a three dimensional matrix. The squeeze function enables us to remove one of the dimensions in an n-dimensional matrix. I’m concerning about mimoML on time and frequency selective fading, could you give me some tips? Thank you very much! @lily: The simulations which I provided above are for flat fading time invarient channel. I have not worked much on MIMO with time/frequency selective fading channel. Could you explain how we can calculate the min J if we use 16QAM instead of BPSK? @ilhami: For 16-QAM it becomes a bit exhaustive. For each spatial dimension, there are 16possible inputs. So, with 2 spatial streams, we need to find the minimum from 16^2 = 256 combinations. (b) Post on Mathworks simulating 802.11a WLAN in Simulink. @shravani: Sure, will do write up on MIMO OFDM infuture. @shravani: I have not posted on MIMO plus OFDM. Seems to be a good addition. I will add that. i am also doing project on mimo ofdm. what is your project title. so that we can discuss on this. Can you please show what changes to do in your codes in order to get Symbol Error Rate instead of BER? @Liran: Depends on the modulation scheme. For BPSK, BER is equal to symbol error rate. For higher order modulations symbol error can result in multiple bit errors (depending on the bit assigned to each symbol). For finding the symbol error rate, we define decision boundaries around each symbol. When ever the received symbol is outside the boundary, then the symbol is in error. You may look at some posts on QAM symbol error rate calculation in AWGN for reference.